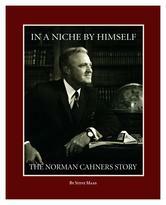 Steve Maas, author of a new biography of B2B pioneer Norman Cahners, will be the keynote speaker. Join us for our annual Azbee Regional Awards, with a special guest speaker. ASBPE’s Annual Boston-Area Chapter Banquet will be held Tuesday, June 21, at John Harvard’s Brew House in Framingham. Regional winners from publications based in Maine, Massachusetts, New Hampshire, Vermont, and Rhode Island will be honored. The event will feature a keynote talk by Steve Maas, author of a recent biography of B2B publishing pioneer and philanthropist Norman Cahners. For ALL attendees who register and prepay by June 6, 2016, the per-person fee will be only $40. Registration June 7 through June 15 is $50. Register for the banquet now. We are planning to have a limited special printing of Steve’s book for the event. Excerpts of the book can be read at the Folio: website. Time: 6:00 p.m to 9:30 p.m.
Social Hour: 6:00 p.m. -7:00 p.m.
Dinner and Speaker: 7:00 p.m-8:00 p.m.